Dr. Frankenstein has created a new abomination in the factories of Shenzhen, China. This 21st century creature from CononMark is called the “iQ” and is a cross between a flash bracket, four speedlights and an LED ring light. The iQ is one of a series of new lighting products from CononMark to have been presented at the Shanghai Photo & Imaging trade show this month. It has four high intensity 10-Watt LEDs that run continuously, for video lighting or for use as modelling lamps. 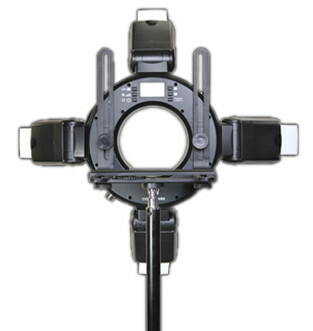 The big guns, however, are found in four speedlight-style flash heads (GN 45). 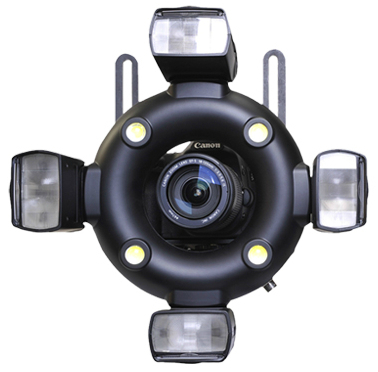 Each head can tilt and swivel independently of one another, complete with wide-angle diffuser panels and bounce cards. The whole set-up is powered from an external battery pack but the control panel is on the ring itself. You can set everything up using an LCD screen on the back of the device. According to initial specifications, a photographer will be able to dim the lights down to 1/128 of full power with 1/3-stop precision. A built-in 2.4GHz radio trigger will sync the unit up from a claimed 100-metre range. But the ring-shaped design and camera bracket suggest you’re more likely to be using it much closer to your DSLR, poking your lens through the 110mm hole in the middle. Pricing and distribution haven’t yet been announced but you can find further details on the CononMark web site. Is this a clever design or a silly one? Let us know in the comments.